K1 Speed, the largest indoor karting company in the nation, opens its second South Florida location in Miami. Irvine, CA May 2, 2014 – Roughly three years after opening its first South Florida location in Ft. Lauderdale, K1 Speed has opened its second Florida indoor karting center in the heart of Miami. Just 10 miles from Miami International Airport and 5 miles from the Trump National Doral, the new facility is within easy driving distance of the city center. The new facility – like the more than one dozen K1 Speed facilities located throughout the United States, from South Florida to Southern California to the Pacific Northwest – features a professionally designed and graded indoor race track, high-performance electric go-karts, and a spacious lounge complete with leather couches and museum-quality collection of racing memorabilia. Intended to be more than a simple go-kart track, K1 Speed Miami has been built to be a world-class entertainment venue. Visitors to K1 Speed Miami will find a fully enclosed center with two separate race tracks, allowing for year-round racing. 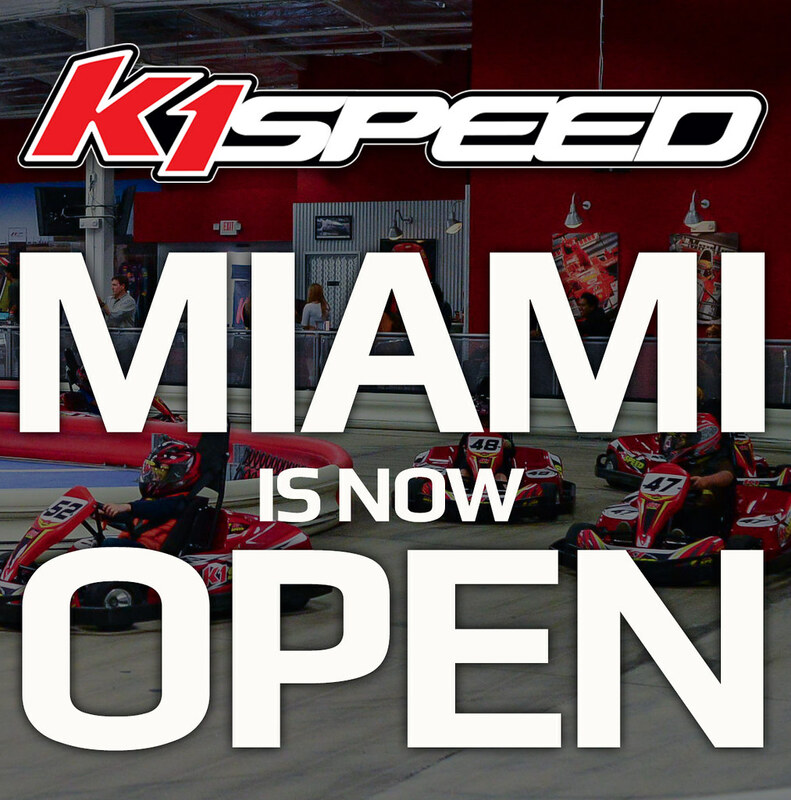 In a city that regularly sees rain and thunderstorms, K1 Speed Miami is open to the public seven days a week, rain or shine. Visitors will also find high-performance, fully electric karts in place of the traditional gas-powered karts they may be accustomed to. K1 Speed utilizes electric karts in every single one of their centers for several reasons: they have a lower environmental impact; they are quieter than gas-powered alternatives and emit no noxious fumes; and they offer superior performance. Racers of all ages will be able to test this performance in a variety of formats (providing they meet basic height guidelines and demonstrate that they can safely operate the karts). In addition to the company’s Arrive & Drive race package, which pits friends, family and strangers alike in 14-lap heats against the clock, visitors can also make reservations for private events, parties, or special occasions. Whatever a group’s needs may be, K1 Speed can accommodate them. In addition to a range of racing options, K1 Speed also has private meeting rooms which can be rented out for birthday and bachelor parties, corporate events, company holiday parties, and team building exercises. These rooms feature Wi-Fi connectivity and multimedia suites should a person be interested in giving a presentation, and catering is available if a party is interested in enjoying food and beverage on site. Of course, visitors can also take advantage of the Pit Cafe snack bar. The new South Florida location is conveniently situated for residents of Miami, Miami Beach, South Beach and Palm Beach. No reservations are required to take advantage of the Arrive & Drive race package, and both adult and junior karts are provided. Founded in 2003, K1 Speed is the premier karting company in America. With kart racing centers in San Diego, Los Angeles, Santa Clara, Sacramento, San Francisco, Seattle, the Inland Empire, Fort Lauderdale, Phoenix, Austin, Houston and several more facilities planned for the near future, K1 Speed brings the thrill and excitement of indoor karting to a large audience. Offering highly-advanced and environmentally-friendly electric karts as well as large indoor entertainment venues that feature authentic racing memorabilia, pit cafes, meeting rooms and pool tables, K1 Speed is a great place to visit with family and friends or to host a corporate event or party.